I wrote on this topic almost four years ago to the day, and it remains one of my most popular posts. Since that original post, my version of the Sales Funnel has evolved somewhat. So as long as people are still reading about it, I thought it made sense to provide an update. Many view the Sales Funnel as merely a simple way to illustrate the sales process. But I've found it to be an effective tool for organizing, evaluating, and tracking a firm's business development efforts. Each stage of the funnel represents a different set of activities—and a correspondingly different set of necessary skills. Stage 1: Prospecting. These are the activities designed to identify potential clients, uncover sales leads, and qualify prospects. A key aspect of this stage is choosing the right clients. Stage 2: Cultivating. Once you've qualified the lead and confirmed your interest in working with the client, the next set of activities involves building a relationship with the client and uncovering needs and expectations. Stage 3: Positioning. After you've established trust and defined what the client really wants, you shift the emphasis to demonstrating your firm's ability to distinctly meet those needs. It's important to show how your solution not only addresses technical issues but delivers business value. Stage 4: Closing. These are the activities—including your proposal and shortlist interview—that help the client determine your firm is the best choice. Generally, the closing stage begins with the release of the RFP or RFQ. 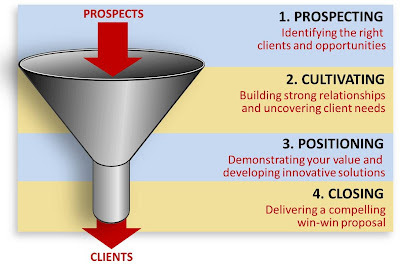 How effective is your "sales force" at each stage of the sales process? Does your firm commit the appropriate amount of time to each stage? Do you have the right people in the right roles at each stage of the process? How effective? One of the basic realities of any kind of funnel is that what comes out of the bottom depends on what you put in at the top. 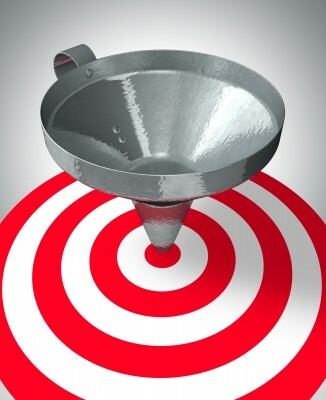 The biggest challenge for most firms is generating enough leads to adequately fill the funnel. Most technical professionals hate cold calling and "working the crowd" at networking events. But there are other, usually more effective, ways to generate leads. Networking among established relationships, including existing and past clients, is productive when you make this activity mutually beneficial. You can also generate leads through effective marketing, although few firms in our business have mastered this. Bottom line: You need to be reasonably effective at each stage of the funnel to be successful overall. Enough time? No matter how competent your sales strategy, you won't get far unless you commit enough time to it. Many firms attempt to develop new business with leftover time. That means their seller-doers often don't spend much time selling as long as they're busy "doing." You know where that leads, especially in a soft economy such as this one. A better approach is to budget people's time for business development and manage those commitments just like you do on projects. In fact, I encourage tracking "sales utilization." Using one's allotted time doesn't necessarily mean it's time well spent, of course, but that's still better than waiting "until I can find the time." Let me marry the first two questions to make an important point. When firms don't invest enough time above and in the middle of the funnel, they often deceive themselves by chasing a lot of RFP opportunities that they have no real chance of winning. That's like cramming stuff in the funnel, trying to go straight from prospecting to closing without adequately cultivating the relationship and positioning your firm. Not only does it rarely work, but it ties up valuable business development time that could be better spent elsewhere. Unfortunately, there are few shortcuts to sales success. Right roles? As you might expect, the most common complaint I hear is, "We don't have enough people who are comfortable above the funnel." But that claim often presumes that the only people who can be productive above the funnel are extroverts, who reportedly comprise a minority in our profession. Consultant Ford Harding surveyed over 100 highly successful sellers of professional services and found that there wasn't one pervasive personality type, nor one approach that worked for all. The secret is to fit the right people to the right roles. Some may enjoy socializing with prospective clients, others excel at building relationships with existing clients. Some are better at problem solving, some at developing winning strategies. Still others can contribute by writing articles or doing internet research. The Sales Funnel helps remind us that selling isn't nearly so monolithic an endeavor as many in our business think. There are many complementary roles and responsibilities, so that almost anyone can contribute if you fit the task and approach to their strengths. Use the Sales Funnel as a framework to facilitate this process—and to evaluate the results.